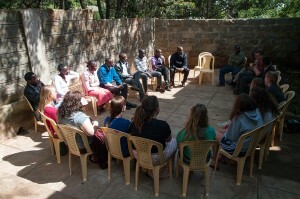 Documents Malone University's service learning trips to Kenya. Our day began by leaving for church at 7 a.m. We attended Kisumu Friends Church this morning for two services. All of the women were able to go up front to perform a song we had prepared the night before; we selected the song Blessed Be Your Name. The song went well but with little preparation we all felt a little uncomfortable. Dr. Dixon was able to preach a message he had prepared from Ephesians. During his message he had a translator who spoke to the non-English-speaking congregation members. After the service was over we all gathered outside and they had a system that required everyone to shake hands with every single person present at the service. Once we had greeted everyone we sat down with a few of the congregation members to have some chai tea and mandazi (doughnuts). The first service was over around 9 a.m., and the second service did not start until 11 a.m. During our wait we sat around and talked to some of the church members. Some of us entertained ourselves in a variety of ways to help pass the time. Once it was time for the second service we all anxiously entered the chapel, but we were greeted with quite the overwhelming heat wave. The pastor of the church, John Muhanji, told the congregation that he was going to talk until two, which was not what we wanted to hear while lacking air conditioning. We got up to sing another song in the second service; we chose to sing Father I Adore You. Luckily, the service did not last as long as Muhanji warned, because we were quite sweaty and uncomfortable. After we left the church we visited Kiboko Bay for a late lunch. Upon entering the restaurant, one of our drivers quickly noticed a hippo sticking slightly out of the water. We all rushed over to take pictures and admire the hippo as she came out of the lake to feed. 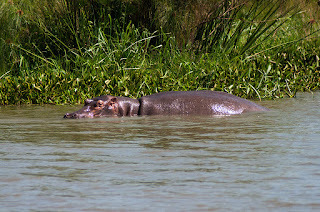 Typically, hippos do not come out during the day, so we were quite fortunate to witness such a sighting. Alexis was particularly thrilled to see the hippo, because she had wished before we left the U.S. to spot one. After we had all of our photos taken we sat down for our meal. We waited for quite awhile for our food to arrive, but we passed the time by chatting and learning some Swahili words from our two drivers. Once we had finally received our meals we climbed into our vehicles and headed to Nakumatt (a common grocery store) to buy some supplies for our journey in the morning. We will be headed to the game park lodge in the morning, and we are hoping to spot some animals once we arrive especially a lion. Tonight during our discussion we were blessed by the kind words of Muhanji who said he has noted from our visit that we possess “cultural humility.” We are thankful for the hospitality we received during our visit to the St. Anna Guesthouse and the people we have gotten to meet during our time here. Now it is time for our next adventure. What’s up baboons and baboonettes? Everyone on the team slept soundly on the very hard, but somewhat comfortable bed last evening. (Please pray that this will continue in our days to come!) Breakfast was ready for us when we came downstairs. It consisted of: bananas (not processed- YAY), cereal with warm milk, coffee, juice, chai tea and omelets prepared to our liking with the options of tomatoes, cilantro, onion and a spicy combination of unknown items. 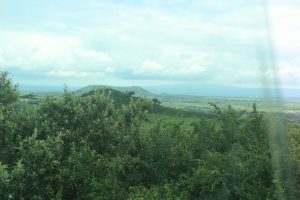 From breakfast we went to Rift Valley Academy (a boarding school where Dr.Case taught and Dr.Dixon attended). There are around 475 students from grade 1 to 12. Most of the students are missionary kids who are receiving an American education while their parents are in the mission field somewhere in Kenya. We learned that they are on trimesters and have chapel and a tea break every day. Hey guys! We finished up our first day in Kenya! After landing at the airport in Niarobi, we stayed overnight at a guest house nearby. Now, we are staying at a guest house in a small town called Kijabe, at a bible college. 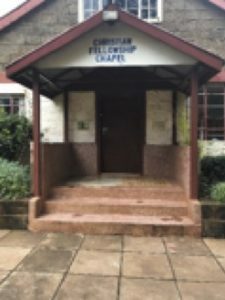 During our first day, we visited a ministry in Maai Mahiu called Rift Valley Fellowship. We will be working with them throughout the week. This ministry works with youth throughout Maai Mahui, and their families. They rescue boys and girls off the streets and connect with their mothers, who often go into prostitution.